Where has this term gone? The first term of the new academic year has whizzed by! With Christmas just around the corner and a new year upon the horizon, we are delighted to bring to you some exciting festive offers to kick start your 2017! 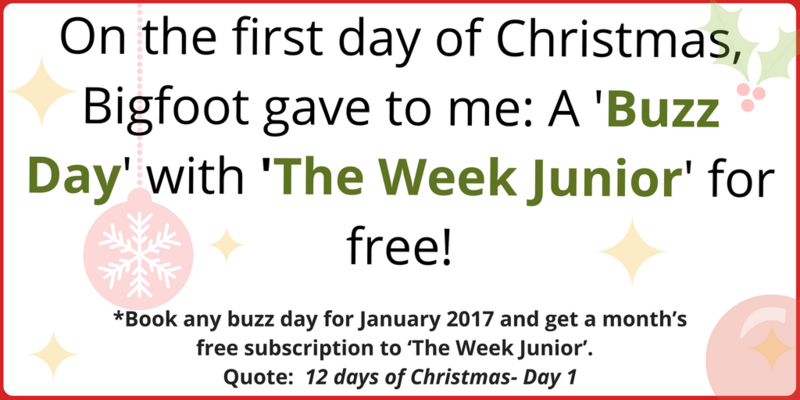 As part of our new collaboration with ‘The Week Junior’ we are offering one month’s free subscription to the children’s weekly magazine , a buzz day and so much more. This Christmas we invite you and your schools to utilise our 12 days of Christmas offers to give your students and staff something to look forward to in the spring term of 2017. Our Christmas special offers include discounts on Panto, Rapspeare, Story Tree Stories, teacher resources and many more fantastic deals. Whatever you are looking to do next term, we’re sure Bigfoot can help! Keep an eye out for all of our offers as they will appear on Facebook and Twitter. Please remember to quote the unique code for the particular Christmas offer you would like to redeem.